Not long ago, Mastodons roamed North America in large numbers. Cousins to the elephant, they thrived in the cool, sub-glacial climate. But the climate warmed, and human hunters arrived. The Mastodon couldn't adapt, and now it's extinct. Change is now coming to your profession. Can you adapt? About 11,000 years ago, the climate in North America warmed. Glaciers melted, rainfall patterns changed, and the differences between summer and winter increased. The Mastodon, which thrived in a cool climate, suddenly found life difficult. A specialist, it couldn't adapt fast enough. It was under stress. A Mastodon skeleton. Photo courtesy Missouri Department of Natural Resources. At about the same time, humans appeared in force. 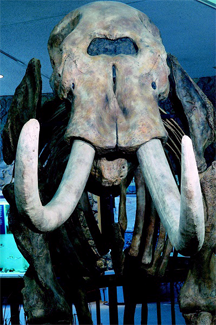 Some scientists believe that human hunting and other activity also contributed to stress on the Mastodon, both directly and indirectly. When the climate warmed, and their food disappeared, and humans started hunting them, the Mastodons couldn't respond. Extinction followed. Are you adaptable? Or are you a Mastodon? Because adaptability gives companies a competitive edge, they train us in Organizational Change. They talk about organizational agility as a corporate asset. But many companies send mixed messages. Though they extol organizational agility, they still hire specialists, instead of people with proven ability to learn and adapt. They pay premiums for specialized skills, and even promote on the basis of proven specialized competencies. to be pretty agile yourselfSuch organizations tend to employ specialized professionals who find it difficult to adapt. When these organizations need new skills, they hire them, or they outsource. They jettison specialists they no longer need — their mastodons. If you work in an "agile organization," and you're a highly specialized professional, you can't be certain how long that environment will remain friendly to your specialization. And unless you can adapt to the coming changes, you'll become extinct. How can you avoid extinction? Be attentive to professional climate changes — the big, slow changes in your industry and profession. If you were a secretary or administrative assistant in 1985, you had to be a good typist. Computer skills were a nice plus, but not essential. Now, typewriters are irrelevant. New technologies and new ways of doing business can change everything. To avoid extinction, learn about five-year trends in your profession. Get ahead of the climate. Your food sources are your company's customers. Are the products and services that you help produce attracting more and more customers? Or are they losing customers? If they're losing customers, consider an internal transfer or a hop to a company that's gaining customers year after year. Stay close to your food sources. Your hunters are professional skills that substitute for the skills you have. For instance, if you're a COBOL expert in an IT organization, Web-based technologies have reduced the value of your skills. You'll either have to find a company that's Web-averse, or learn Web-based technologies, or find another career. If your specialty is mature, target a new, fast-growing specialty and become an early expert. Outrun the hunters. Would you like to see your comments posted here? rbrendFKaiHPLJvBFqLMBner@ChacUkmfeUfjBvVapLGHoCanyon.comSend me your comments by email, or by Web form. If you lead an organization, and people are mired in meeting madness, you can end it. Here are a few tips that can free everyone to finally get some work done. Serendipity in project management is rare, in part, because we're under too much pressure to see it. If we can reduce the pressure, wonderful things happen. Age discrimination runs deep, well beyond the hiring decision. When we value each other on the basis of age, we can deprive ourselves and our companies of the treasures we all have to offer. I offer email and telephone coaching at both corporate and individual rates. Contact Rick for details at rbrenZDmbglJiLwehpLGzner@ChacquhmcLnHfnQobKfhoCanyon.com or (650) 787-6475, or toll-free in the continental US at (866) 378-5470.